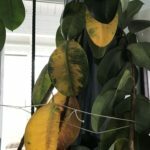 What is my rubber tree wanting? The leaves at the top of the plant are curling. The leaves at the bottom seem to be drying up and falling off. The plant is from my mother's funeral on Dec. 22, 2011. It is still in the pot it came in. Also, when is the growing period of the rubber tree? Curling leaves are usually indicative of too little water. The best way to check is by inserting your finger into the soil (up to an inch) and see if it feels wet at all. If it's dry, water and if not let it be. This too would cause the leaf drying and dropping. They will go dormant during winter but remain active the rest of the year.